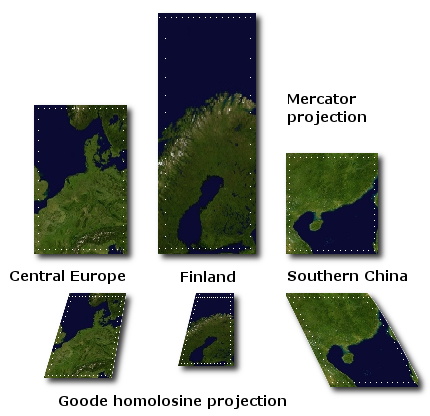 Whenever you see a map, the chances are that it uses the Mercator projection. It's a fine enough projection especially on a local scale, but I've always disliked the way it makes places that are far from the equator seem much larger than they really are. Since I've lived most of my life in Finland (i.e. above 60° N or as high up north as Alaska), I find that this distortion heavily affects my ability to accurately estimate distances in other parts of the world even when I'm well aware of this problem. I'm considering purchasing a poster with such an equal-area world map and hanging it on a wall somewhere I can see it every day. That way I could perhaps overcome the systematic error that the Mercator projection has taught me.